Now that you have written down your goals and maybe even have started an inspiration board, you should ask are your goals specific, measurable, achievable, realistic and timely and most importnt is it positive? Rather than vowing "to exercise" for example, reword each goal so that it is clear and measurable: I will walk 30 minutes every day. I will complete a 5K race. I will do a yoga DVD twice a week. Specific: A goal that answers the classic 'W' questions (who, what, when, where, which, why) is a specific goal. Specific goals have a much greater chance of being achieved than a general goal. Measurable: When you measure your progress, you stay on track. 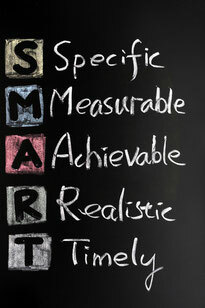 Measurable means that when you write your goals out you can easily answer how much or how many it takes to get there. Achievable: When you choose goals that are important to you, you will figure out ways to make them happen. This may mean that you need to develop skills and strategies for achieving your goals. Realistic: In order to be realistic, a goal my have an objective to which you are both willing and able to work towards. Timely: Set a time frame for achieving your goal. If your goal doesn't have a due date, there is no sense of urgency in working towards it.